A dwarf variety with stunning deep burgundy foliage. Little Devil&trade; is especially useful for smaller urban gardens or where low maintenance is desired, as it needs little to no pruning and is free from pest and disease issues. 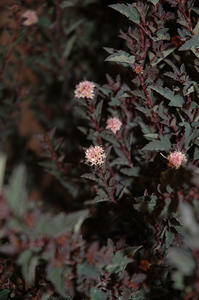 The dark foliage is beautifully offset by button-like white-pink flowers in June.